Launch Ramp: Closed, due to extremely low water level. Campground: Open, drinking water tuned on as of 4/18/19. Fishing Conditions: DWR attempted to conduct a Bluegill salvage on 2/11/19. It was found, many fish were dead and those that were alive were directly under the ice. It is likely the fish have succumbed to low oxygen levels. With that being said please remember, on January 1, 2019, normal fishing regulations went back into effect. *As of September 10, 2018, the water level dropped below the boat launch ramp for dam repairs. Construction is scheduled to allow for the water level to begin filling Fall 2019. Boat Smart Wear Your Life Jacket!! Steinaker Reservoir is a large reservoir immediately north of Vernal in northeastern Utah. It is an off-stream	impoundment of Ashley Creek, which drains the eastern High Uinta Mountains. A state park at the reservoir provides year-round recreational opportunities. 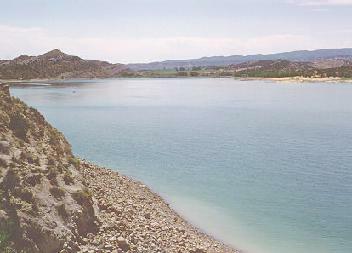 Steinaker Reservoir is easily accessible from US-191 about four miles north of Vernal. The highway follows the	east shore for about a mile. An access road leads across the north end of the reservoir to the state park, which is on the west side of the lake. Bass limit 6; only 1 may be larger than 15 inches. In the springtime, shallow-water fishing really perks up once the water temperatures get around 55 to 60 degrees for bass and bluegill, and from ice-off to about 60 degrees for rainbow trout. The fall is another 'hot' time for trout, when the water cools down once again. During the summer, bass, trout and sunfish all seek out cooler waters, so anglers need to fish deeper. For bass and bluegill, especially in the spring, try fishing in the shallow waters in and around the submerged vegetation. For rainbow trout, fish just outside the weeds, or in roughly 10 to 15 feet of water or more. Rainbows may be in shallower waters, but it's too easy to catch vegetation when trolling. These tips, in fact, apply to many waters in Utah. Casting into openings in or near areas with submerged vegetation is usually very productive, especially for bass and bluegill.